Years ago, when studying for my doctorate in Social Welfare Policy, I learned a great deal about the UK social welfare system from a professor who liked it very much. I learned words like “uptake,” which was the percentage of poor people eligible for a benefit who were actually using it. So if the uptake was only seventy percent, say, there was a genuine concern that 30 percent of the people in need weren’t being helped. This seemed absurd to us since in the United States it was understood that we make it as difficult as possible for poor people to receive benefits even when they are entitled to them. Judging from this movie, a lot has changed in the UK. 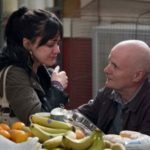 In this film, directed by Ken Loach, who came out of retirement to do it, Daniel Blake (Dave Johns) is a 59-year old carpenter living in Newcastle who has had a heart attack. He is receiving temporary benefits but needs to apply for longer term ones, since his doctor has told him he must lay off work for a while. His frustrating encounters with the welfare department get worse and worse, as bureaucratese, insane deadlines and impossible requirements mount. Meanwhile Dan, a widower, is becoming poorer. He befriends a young woman, Katie (Hayley Squires) and her two children who have also been given the proverbial run-around. Katie and her children have been re-located from London because Newcastle had the housing that they needed. Her mother lives in London so she now has housing but lacks adult family support. I was reminded of a social work client I had, years ago, whose apartment building in Manhattan burned down and she was re-located to Staten Island, away from friends, familiar surroundings and the community center where this woman, who had developmental delays and psychological problems, used to spend each day with her children. Our welfare system is crazy and so is theirs. Dan befriends Katie and her children Daisy (Brianna Shann) and Dylan (Dylan McKiernan), helping her fix the many broken things in her new apartment and making wooden toys for the kids. Meanwhile he has been turned down for benefits and the welfare department, in spite of his doctor’s statements, believes that he can work. All appeals must be filed online but he doesn’t know how to use the internet. Caseworkers don’t help him and one that wants to is warned off by a supervisor. Almost all of the welfare office people are like automatons, interested only in spouting the rules and not interested in listening. This is worse than it used to be and probably only slightly satiric. The world has turned too many workers into robots. Anyone who has waited countless minutes or hours while periodically hearing “your call is important to us” or has heard sales people spouting stock phrases like “everyday low price” knows about this. Here I have to divert from the rave reviews this movie received, not to mention receiving the Pomme D’or award at the Cannes Film Festival in 2016 and the 2017 BAFTA Outstanding British Film of the Year award. Clearly all judges were moved by the horrendous story. Most of the reviews focus on how horribly the UK (and somehow by implication the US) treats poor people. But the story was carried on the backs of Johns and Squires, actors who had very little to work with except for a few good lines and scenes here and there. Dan has a special personality. He’s not just an old guy but he’s smart and funny and kind. He’s lost his wife but he isn’t depressed particularly. His boss wants to help him. His neighbor wants to help him. But he doesn’t accept their help. The question is why. His apparent refusal to ask acquaintances for help, given the main message of the movie, isn’t going to move people to the point of thinking he doesn’t deserve benefits or think of him as a “cheater.” But it weakens the plot and puts a burden on movie-goers. We must suspend disbelief quite often in this film. In 1975, Frederick Wiseman’s documentary, Welfare, almost 3 hours long, followed people who received welfare to many of the multiple offices they had to visit in order to keep their homes and feed their families. It was real. It was gritty. It was not for everyone. That’s why we turn to art to illustrate social problems. But I, Daniel Blake, while illustrating social problems, is a not particularly good art. Loach is well-known and admired in England. His mini-biography on the Internet Movie Data Base (IMDB) describes his specialty as “British socialist realism.” His 1969 movie Kes was widely acclaimed. Screen-writer Paul Laverty has similar political leanings. In I, Daniel Blake they have succeeded in evoking sympathy for the British poor and perhaps an urge among people to reform the system. And maybe I’m a minority of one in wanting more in the way of design, artifice, plot turns, and surprise. I got tired of suspending my disbelief over and over again. In this movie plot devices, like nails not fully fastened, stick out. The unevenness of the film is striking. Dan is a smart guy but his decision-making, regardless of the obstacles he faces, seems flawed only in ways that impoverish him further or make a point about the welfare system. He makes beautiful furniture at home, and wooden toys for the kids. It seems unlikely that it has never occurred to him or no one has ever told him that he could sell these things at a good price. He asks strangers but not friends for help. He helps Katie and her kids but eventually disapproves of her way of managing. Every major plot turn is predictable. There is no doubt that this is a good movie, worth watching. The dialogue is often striking and some scenes are riveting. A scene of a hungry person at the food bank will sit in my mind forever, and I admit is worth the price of the movie. (By the way, the woman who plays the food bank employee isn’t an actor but in fact works at a food bank. She wasn’t acting.) It’s a testament to Western greed that anyone in this world should go hungry or homeless. The story slogs along to a conclusion that seems inevitable. Almost from the beginning one knows that Dan is going to write “I, Daniel Blake” in big letters somewhere as a declaration of his humanity. And he does.